Colebourn, Harry, 1887-1947 -- Monuments. On August 24th, 1914, while enroute overseas during World War I, Lieutenant Harry Colebourn, V.S., of the 34th Fort Garry Horse Regiment of Manitoba, purchased a black Canadian bear cub at While River, Ontario. He named her Winnie after Winnipeg, his home town. The bear became the pet of the soldiers. While Lieutenant Colebourn served in France, she was left in the care of the London Zoo. In 1919, he gave her to the zoo where she was visited and loved by many, including the author A.A. Milne and his son Christopher. In 1926, A.A. Milne gave the fictional character Winnie-the-Pooh, named after Lieutenant Colebourn’s bear, to Christopher Robin and his friends for posterity. Winnie died at the London Zoo on May 12, 1934. “Winnie-the-Bear” by sculptor William Epp was dedicated to the children of the World on August 6, 1992. Dedication of the bronze statue of Harry and the bear at the Winnipeg Zoo. 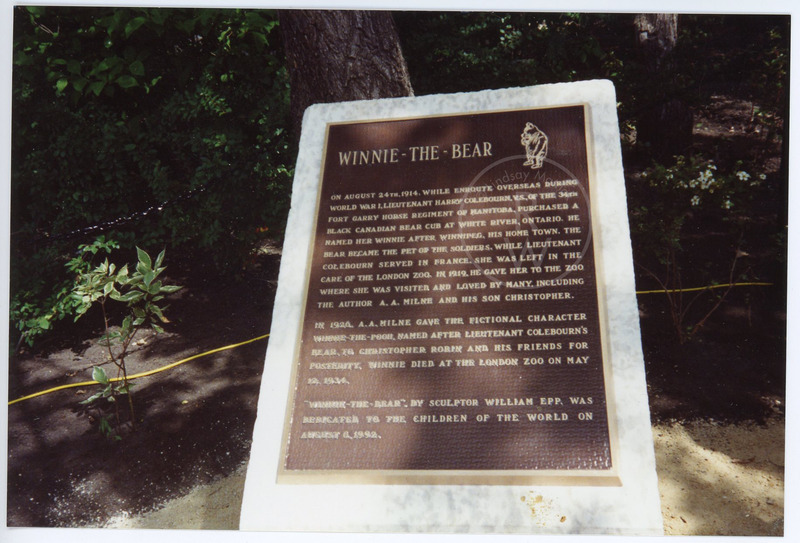 “Winnie the Bear plaque,” Remembering the Real Winnie: The World's Most Famous Bear Turns 100, accessed April 25, 2019, http://therealwinnie.ryerson.ca/collection/items/show/16.